“What it means to find Christ in such poverty, and what His swaddling clothes and manger signify, are explained in the previous Gospel [Luke 2:1–14]. His poverty teaches us to find Him in our neighbors, the lowliest and the most needy of them. His swaddling clothes are the Holy Scriptures. The result is that in our life of work we deal with the needy, but in our life of study and meditation we deal only with the Scriptures. Thus Christ alone is important for both lives; He stands before us in every purpose” (LW 75:254). Quotation is from Luther’s Works, the American Edition: vol. 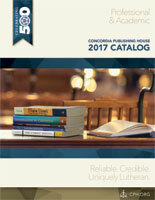 75, copyright © 2013 Concordia Publishing House. All rights reserved.